Head coach Rex Ecarma fist bumps senior Brandon Lancaster. 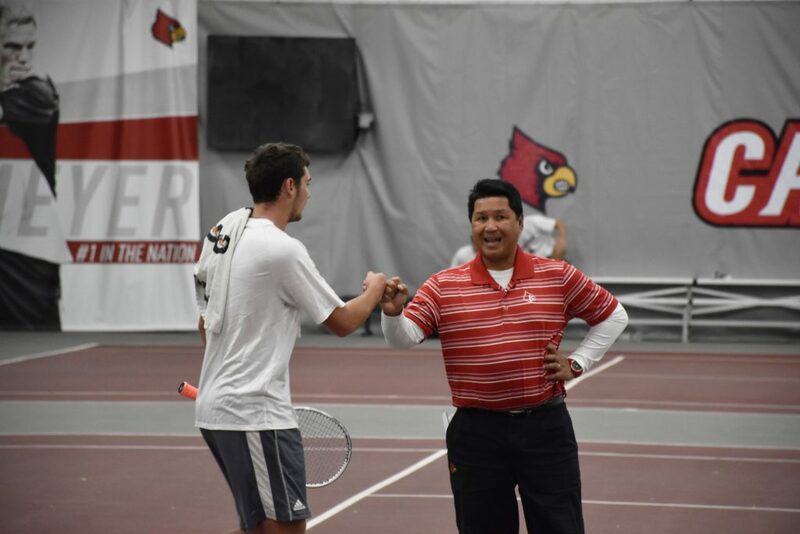 Entering his 29th season as head coach, Rex Ecarma has men’s tennis primed and ready to go for collegiate play. The Cardinals won at the University of Hawaii before returning home for victories over Butler and Lipscomb. The journey to Honolulu proved crucial in preparing Louisville for its home-opening matches. Ecarma’s team is an interesting mix of veterans and newcomers. Without sophomores on the roster, student athletes fall at opposite ends of the maturity spectrum. It’s not often one finds such a unique blend on collegiate squads, even for Ecarma. The long-time leader has coached across five conferences with a variety of talented teams. When Ecarma last had a “bookends” brew, he finished the season with enormous success. Success is hard to find in the ACC, the toughest tennis conference in the country. U of L lost six of its last seven conference matches to finish the 2018 regular season. Ecarma described the ACC slate with a not-so-pleasant metaphor. The six Cardinal freshmen form an extremely skilled, remarkably diverse group. Sergio Hernandez Ramirez and Juan Paredes hail from Colombia, Marcus Sulen from Norway and Fabien Salle from Switzerland. David Mizrahi is a New Yorker and Alex Wesbrooks, named Kentucky Mr. Tennis in 2018, is a Louisville native. On the veteran side, senior Brandon Lancaster leads singles play ranked No. 104 in the nation. He pairs with fellow senior George Hedley in doubles and the two began 2019 ranked No. 34. The Cards notched a tough loss at No. 17 Virginia before traveling to Florida for the National Kick-Off Tournament. Ecarma said the event is comparable to the NCAA tournament on steroids. Louisville lost 4-0 to Florida Atlantic in the first round of the tournament, then defeated William & Mary 4-1 in a consolation match. Next up, the “Fight Squad” hosts Georgia State on Friday, Feb. 1 at 3 p.m.